New Nursery, Breastfeeding, Sleeping and other things | Call Me Mummy!! So we’ve been settling nicely into our new home and my new job although the lack of Internet bit hasn’t been great. We’re getting to know North Wales a little bit more and really it is such a lovely country with lots of wide open countryside! We’re definitely looking forward to the summer here! But what else have we been up to? Since the sleep training Anjie’s being sleeping quite well! Most times she sleeps through, waking up a couple of times during her sleep cycle but goes back to sleep almost immediately. She sleeps with a bottle though so I’ll imagine getting rid of the bottle is going to be another battle which we will have on our hands in the near future. Although we’ve switched to sippy cups, she still prefers her night milk in a bottle! I’m hoping by the time she gets older we’ll just get rid of the bottle and that’ll be end of that… but we’ll see! So what else is my little sunshine doing? She’s has always been an independent baby and its becoming more apparent everyday. Even at nursery they say she’s very good at wandering off on her own – something she does a lot of here in the new house too! Once she gets familiar with her environment, she just wants to explore! She still isn’t saying proper words but we can carry off a conversion easy now! And she can go on and on really! She’s definitely going to be a talker this one! She loves to dance too, put on a tune and she just starts to sway! I’m definitely introducing her to Zumbatomic when she’s older!! You all have a lovely week! You have to get a video of your little dancing machine and post it on here! I bet she is super adorable when she is dancing! As far as breastfeeding goes my supply dramatically dipped when Abby started sleeping through the night. You are a rockstar mama for making it to one year of breastfeeding. I have 4 more days to go to make it to a year and if it wasn’t for my frozen supply I don’t think I would have made it! I know! I keep trying to get a video but she stops and smiles whenever she sees the camera! At least you were even able to do the storage bit! I just couldn’t be asked! 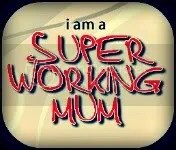 We’re all rock stars mums! You must be sooo excited about the partyyy!! Can’t wait for the pictures! I’ll be stalking your blog till I see them!! sounds like you’re settling in just fine…. 🙂 Moves are tough on everyone but she seems to be adjusting quite well. And yes, you need to snag some videos of her dancing! Pingback: Switching Childcare for a Toddler – Pros and Cons | Call Me Mummy!! Pingback: Back to blogging – What we’ve been up to! | Call Me Mummy! !